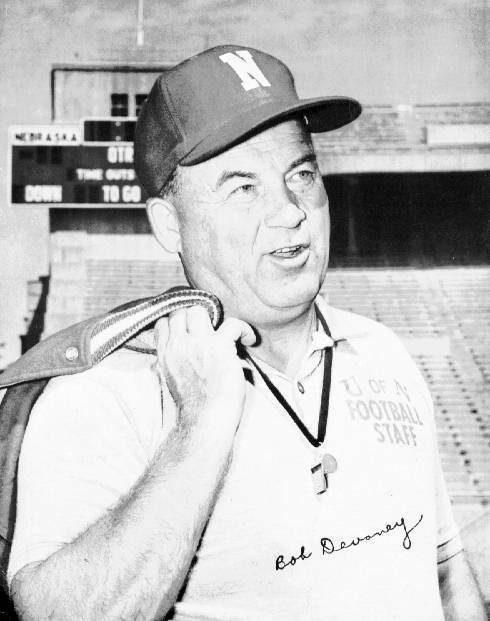 To understand what Robert S. Devaney did for Nebraska football, one must look at the state of the program he inherited in 1962. It was, undeniably, one of the worst in the nation. The Huskers had managed just three winning seasons since 1940 and were mired in the bottom 10 in winning percentage during that stretch (.368). And there were no signs of a turnaround. In the five seasons leading up to his arrival, NU posted a 15-34-1 record, with more than a third of those losses coming by shutout. In only four games during that five-year stretch did the Huskers ring up more than 17 points. Dismal stuff indeed. Then along came Bob. His first team went 9-2, including a Gotham Bowl victory over George Mira and the Miami Hurricanes. Suddenly, Nebraska football was fun to watch: Point production was nearly triple what it used to be, and every game was a sellout. Soon, NU would be a contender for national titles. Seven years after his arrival, Devaney engineered another transformation. After back-to-back 6-4 seasons in 1967 and 68, he realized his offense had fallen behind the times. 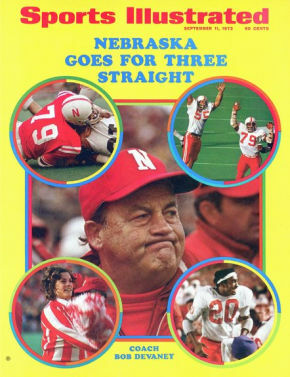 At the suggestion of his assistant Tom Osborne, he switched to an I formation with an un­bal­anced line. Again, the results were immediate -- a 9-2 season in 69, and national championships in 70 and 71. Devaney played end at Alma College in Michigan (class of 39). He coached high school football in Big Beaver, Keego Harbor, Saginaw and Alpena, Mich., before joining Biggie Munn and Duffy Daugherty as an assistant at Michigan State. From there, he became head coach at Wyoming in 1957.